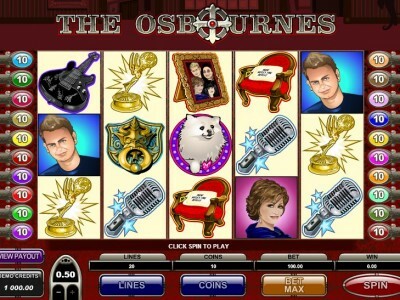 Join the famous Osbournes family in this cartoon classic vegas pokies game. Featuring all members of the family including Ozzy, Sharon and Kelly along with their cute puppy mini, this game offers multiple bonuses and mini’s free spin trail bonus. Symbols include Ozzy, Sharon, Jack, Kelly, awards, family portrait, signed guitar and mini as the scatter. The Osbournes family symbol acts as the wild and substitutes for all others. The grab a gift bonus is triggered randomly and you can test your skill by pressing stop landing on the gift box of your choosing. Each gift provides a cash prize multiplier and you can only pick one box. Like most Australian pokies the Osbourne slot also provides a 3, 4 or 5 scattered bonus called Knock Knock. Here you will select a knocker which reveals a multiplier on your original bet. The most exciting aspect of this vegas pokies is the Mini’s trail free spins bonus. This is won when 3 or more of the mini cute white fluffy dog scatters appear. You can win up to 300,000 in this bonus and you will initially be provided 10 free spins with 2x muliplier. A further mini scatter on reels 2, 3 or 4 awards a movement along the trail. You aim is to guide mini to all members of the Osbourne family to win more free spins along with cash prizes. The payouts are huge if you are lucky enough to win this free spin bonus as it has the potential to go for 40 free spins. Overall The Osbournes vegas slot is a classic among online casinos and continue to draw a strong player following. You can gamble between 1 cent to 50 cents per payline with the game being a 20 payline game, therefore the maximum bet is $100 per spin.